At less than 10 km (6 mi), I’m actually already at my scheduled goal for the day and it’s only noon. I’ll go a bit farther and be into tomorrow’s schedule. This morning (Sunday) was full of cyclists in the wine valley along the Unstrut (known as the Unstrut Wine Road). I encountered one vineyard after the next planted on steep grades. 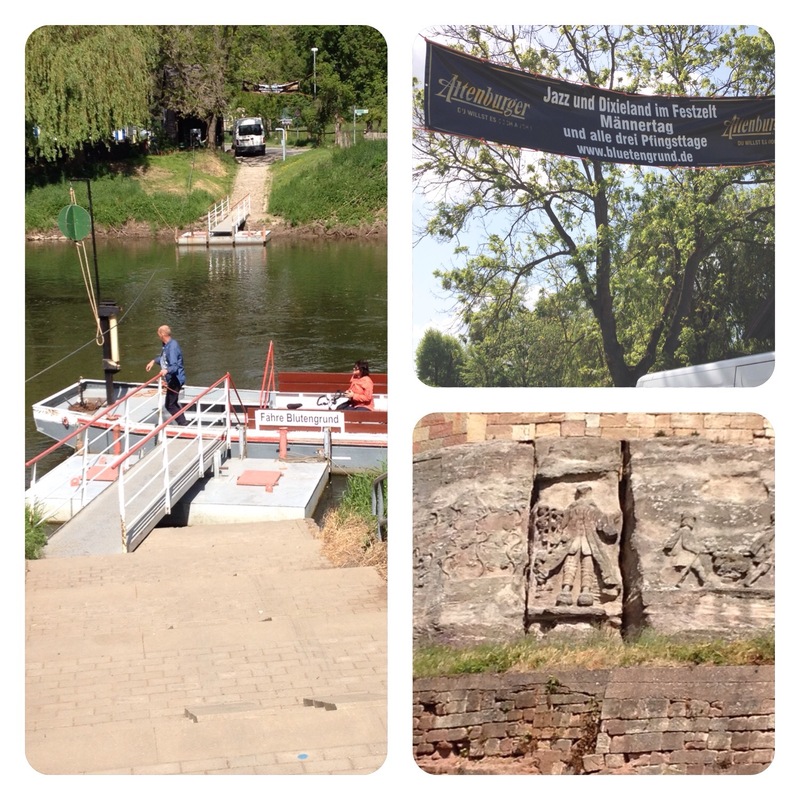 And just before Naumberg, I crossed the Saale by ferry (the Unstrut becomes the Saale). 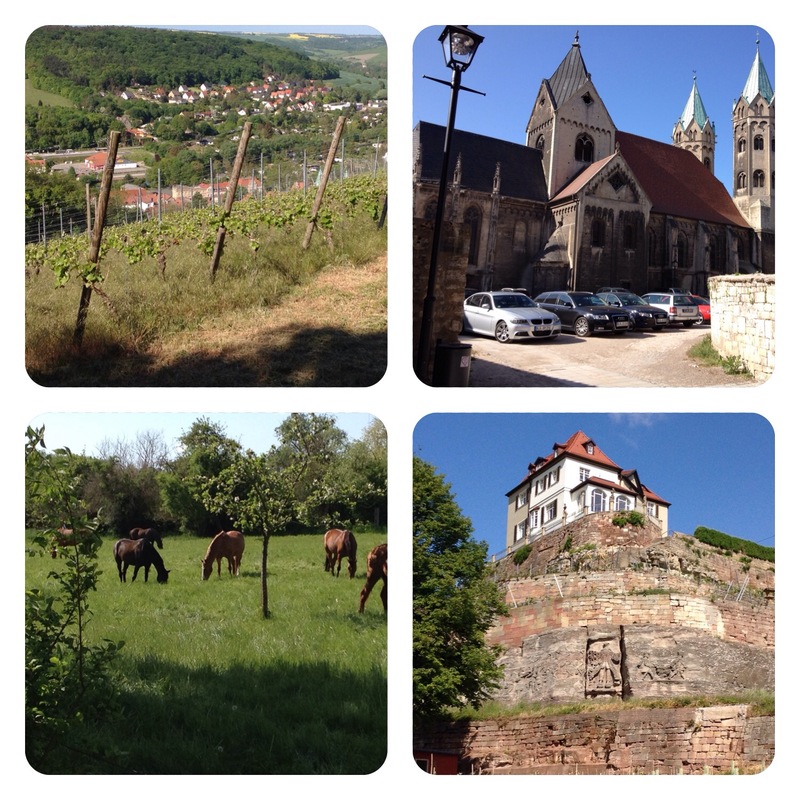 Here are some pictures from this morning that hope to capture the picturesque scenery. The view into the town is still Freyburg and the church is from there as well. Dixieland Jazz sign is for Lucille–yet another venue for her favorite music. The close up of Noah is one of many biblical scenes under the high wine estate–it’s “proof” that Noah was the first vintner with grapes in his right hand!!! Can’t believe that 2/3 of my journey is over at the end of today. So far, it’s been a marvelous adventure: a snapshot of how the DDR (the former eastern Germany) has evolved over the last 25 years, an immersion into over a 1000+ years of history into this part of Europe and a kingly protected road (the Via Regia) that leads directly to Santiago (known here as the Jakob’s Weg=Camino de Santiago). Your pictures definitely capture the picturesque scenery in wine country. Love the stone carving of Noah! Glad you are enjoying your adventure on the Via Regia, Kurt!